FRANKFURT - Volkswagen said it might take legal action against its partner Suzuki after Suzuki served VW with a notice of breach of contract, demanding the German company give it access to key technologies. VW "is keeping all options open" with regard to the partnership, company spokesman Michael Brendel said on Friday and is examining options which also include possible legal action. VW's reaction came after Suzuki accused Volkswagen of breaching a partnership pact by withholding hybrid and other key technologies it promised to share. Suzuki has given VW "several weeks to remedy the breaches," Executive Vice President Yasuhito Harayama said Friday at a media briefing in Tokyo. He declined to say when Suzuki expects the partnership to end. Top executives from both companies are holding talks, he said. Harayama said Suzuki was especially keen for gasoline-electric hybrid drivetrain systems and other environmental technologies, but VW never delivered. VW responded by saying it had always honored its agreements with Suzuki. "The accusations are completely unfounded" and VW has done all it could to safeguard the partnership, Brendel said. Suzuki's Chairman Osamu Suzuki said in a statement on Friday: "This capital alliance was intended to facilitate Suzuki's access to VW's core technologies. I remain disappointed that we have not received what we were promised. If VW will not allow access it must return Suzuki's shares." The two automakers have been at odds since VW said in its March annual report that it could "significantly influence financial and operating policy decisions" at Suzuki, describing the Japanese company as an "associate." Suzuki has sought to end the partnership after VW said the Japanese company violated the cooperation agreement by purchasing diesel engines from Fiat for cars built in Hungary. Suzuki builds the Suzuki SX4 and Fiat Sedici from one common architecture in Suzuki's plant in Esztergom, Hungary. Chairman Suzuki said Sept. 22 that VW's allegation had "significantly disparaged Suzuki's honor" and demanded a retraction. "Now that both companies are claiming that the other infringed on the partnership, it seems like they will have to legally resolve this process," said Tatsuya Mizuno, director of Mizuno Credit Advisory in Tokyo. "It doesn't look like they will be able to rebuild their relationship. 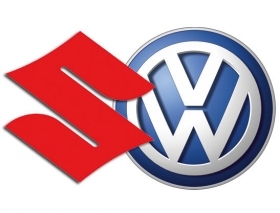 VW bought a 19.9 percent interest in Suzuki for about 1.7 billion euros in January 2009. Suzuki took a 1.49 percent share of VW.